It was at the end of one of Lowell's talks that he was inspired to ask, “If I can find the know-how and source of supplies, how many of you would like to make rosaries for the Mother of God?” Twenty hands went up. That was the beginning of our Lady’s Rosary Makers of Grand Rapids, Michigan in 1957. Stanislaus financed the entire mission until his death in 1964. It all began way back in the early 1950’s. 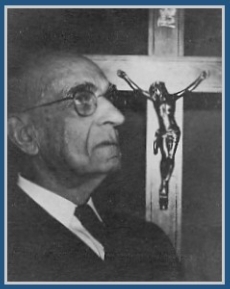 A Grand Rapids man, named Stanislaus DesPres, was making crucifixes for the missions. Lowell Vickery, a convert to the Catholic Faith whose family had seven Methodist ministers at the time, joined with Stanislaus and they worked together making crucifixes sending them to the missions. The missionaries wrote appreciative letters but many asked for rosaries to be sent too. 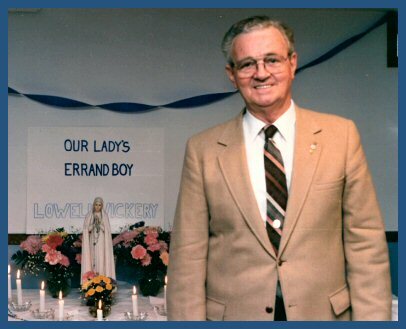 As Lowell grew deeper in his faith he became a devotee of Our Lady of Fatima. He began giving talks on Fatima to various groups in churches around the area. 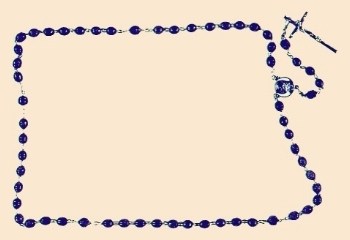 "The faithful children of the rosary shall merit a high degree of glory in heaven"
Today we continue on with the endeavor they began and have grown to over 200 rosary and scapular makers. We send out our newsletter to more than 400 people who are involved in this ministry in some way. We have expanded to other areas in West Michigan. Last year we sent over twenty-five thousand rosaries to the missions.